With the big Christmas and New Year’s holiday rush nearing, as well as Thanksgiving for Americans and school holidays for those of you with children, it’s time to start thinking about what your plan is. One planning item that can take awhile to sort out during the holidays is hotels. 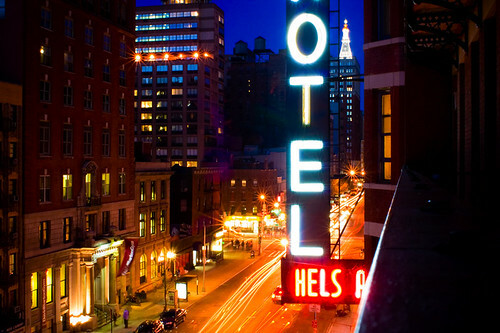 Make this holiday season less stressful with my top 10 hotel tips for holiday travel. 1. When it comes to the holiday season, book early and book often. Just kidding about the often part – but yes, things will be filling up fast this year so don’t delay in making plans. If nothing else, it’s worth getting a reservation that you can cancel until you firm up plans – especially if you’re travelling somewhere in high demand. 2. Don’t overextend your stay with family. Budgets tight and opting instead to stay with a friend or family member? Don’t overextend your welcome – it will leave you wanting a “real” holiday when you get home. Anything more than a week is guaranteed to get on the nerves of everyone. One suggestion I’ve had before is to stay with friends, but the last couple of days check-in a hotel for some peace, relaxation, and enjoy a change of scenery. 3. Make sure you know the hotel’s policies on children. Recently, my cousin checked into a hotel in Germany with her 14 year old daughter. The hotel was upset because she had picked “child,” but they considered her an adult. I don’t hear about this often, but it’s something to keep top of mind. 4. Double check those amenities before you click ‘confirm.’ Don’t assume that a hotel will give you a rollaway bed, that breakfast is free, or that because it is an all-inclusive that everything is included. Read the details and make sure you’re clear on what you are getting. 5. Do you know how you’re getting there? One of the hardest parts of a trip is getting yourself orientated when you arrive at your destination. What I like to do is make sure I have a very clear plan of getting from the bus/train/plane to the hotel. From the hotel you can regroup, get your bearings, and get help from the hotel clerk if need be. But nobody likes getting lost while lugging suitcases, so have a plan when you land! 6. Strongly consider travel insurance. When it comes to holiday travel, you have a lot of potential problems from snowstorms, overcrowded and overbooked planes and hotels. In general, I think it’s a good idea to have cancellation insurance to cover you if you have a lot of problems getting out or getting home. 7. Consider bringing your power strip. If you aren’t bringing a bunch of gadgets and devices with you, you might be getting them as a gift. Hotels are slowly getting into the game but you might want to think about bringing a power strip. I was very thankful the last time I was sharing a hotel room and we had power strip – made things much easier, especially for changing phones quickly during stops back in the room. 8. Don’t cheap out. Don’t book the cheapest hotel when it’s not worth it. Staying an hour from town, which costs several quid each way for transport costs? Not worth it. Getting the hotel that isn’t clean? Never ever worth it. The cheap cheap option is not always the best choice. 9. Ask about discounts and packages. Hotels may have an offer that you didn’t see or that isn’t publicised – meal vouchers for nearby restaurants, discount cards for local attractions, or room packages that include freebies (especially if your stay is at least 3 nights). It doesn’t hurt to ask, even if it’s just a friendly chat with the concierge after you’ve checked in. 10. Print out a copy of your confirmation. Call me old school, but I like to have a copy of my confirmations on me when I travel – especially if going abroad and possibly not able to access that information on my phone. It’s handy when things go wrong.